So now you know all those vitally important reasons as to why you should get some simple recipes under your belt – social prowess, health, thriftyness – it's time to get stuck into the actual cooking malarky! Which brings me to recipe number one of our top ten student recipe series, the ever-comforting, ever-satisfying British favourite... bangers and mash! This recipe uses easily available ingredients which you are likely to either have in your cupboard (yes, that's it, look behind the bottles of beer) or should be able to pick up cheaply from your local shop. Serve up with some peas, broccoli or other member of the veg family to help gain your 5 a day! Heat the oil and add the onion. Cover and cook gently for about 12 minutes until the onion has collapsed. Add the sugar and stir well. Uncover and continue to cook, stirring often, until the onion is very soft and golden. Add the thyme, stir well, then add the flour, stirring. Gradually add the stock. Bring to the boil and simmer gently for 10 minutes. Meanwhile, put the sausages in a frying pan and cook over a medium heat for about 15–20 minutes, turning often, until golden brown and slightly sticky all over. For the mash, boil the potatoes in plenty of lightly salted water for 15–18 minutes until tender. Drain well and return to the saucepan. Put the saucepan over a low heat to allow the potatoes to dry thoroughly. Remove from the heat and add the margarine or butter, yogurt or milk and salt and pepper. Mash thoroughly. 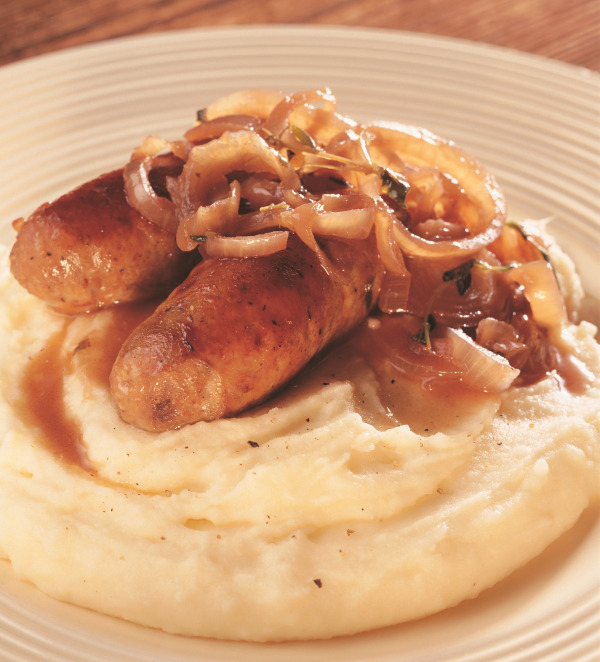 Serve the potato mash with the sausages and onion gravy. Place any remaining sausages and mash on a plate or in a dish, cover with clingfilm and keep overnight in the refrigerator. Pour any gravy into a small jug and cover with clingfilm. Do not freeze. To reheat, pierce the clingfilm covering the sausages and mash in 2–3 places. Heat on High in the microwave for 2 minutes 20 seconds. Allow to stand for 1 minute. If not piping hot, heat for a further minute. Stand for 1 more minute then eat. Pour the gravy into a small saucepan and heat, stirring until it comes to the boil. Add a little extra stock if necessary.